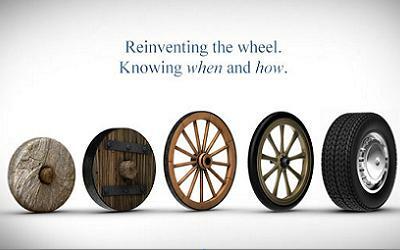 Reinventing the wheel may be an ironic cliche—-it is not clear when the wheel itself was actually invented. The modern “invention” of the wheel might actually be a “re-invention” of an age-old invention. Additionally, many different wheels featuring enhancements on existing wheels (such as the many types of available tires) are regularly developed and marketed. Reinventing the square wheel is the practice of unnecessarily engineering artifacts that provide functionality already provided by existing standard artifacts (reinventing the wheel) and ending up with a worse result than the standard (a square wheel). Preinventing the wheel involves delaying a task if it is expected to be undertaken later. An example would be, “We don’t want to preinvent the wheel” when discussing a solution to a problem when it is known that the solution is being developed elsewhere. It is not necessarily pejorative. Redefining the wheel is the practice of coming up with new and often abstruse ways of describing things when the existing way of describing them was perfectly adequate. 题图：Reinventing the Wheel. Knowing when and how.